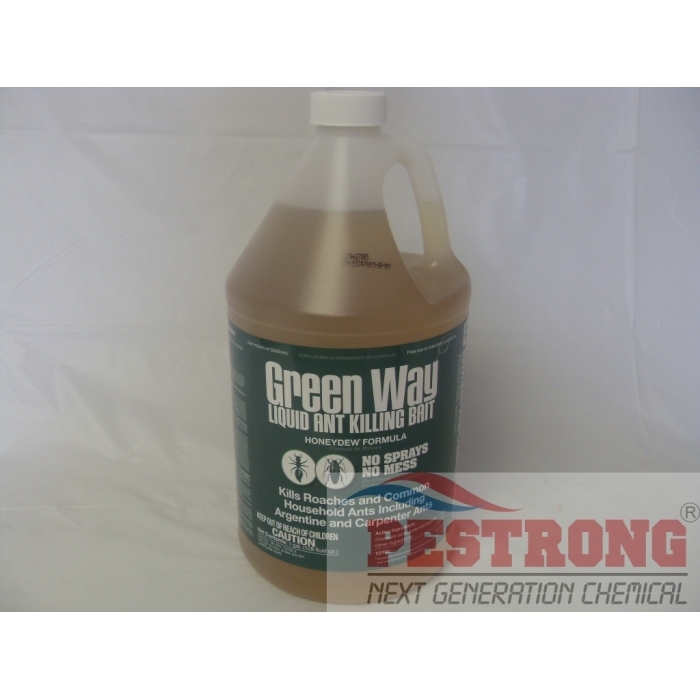 Where to Buy Green Way Liquid Ant Bait, Green Way Liquid Ant Killing Bait Gourmet - 32 Oz - Gallon - $17.95 for Sale with Fast Free Shipping! 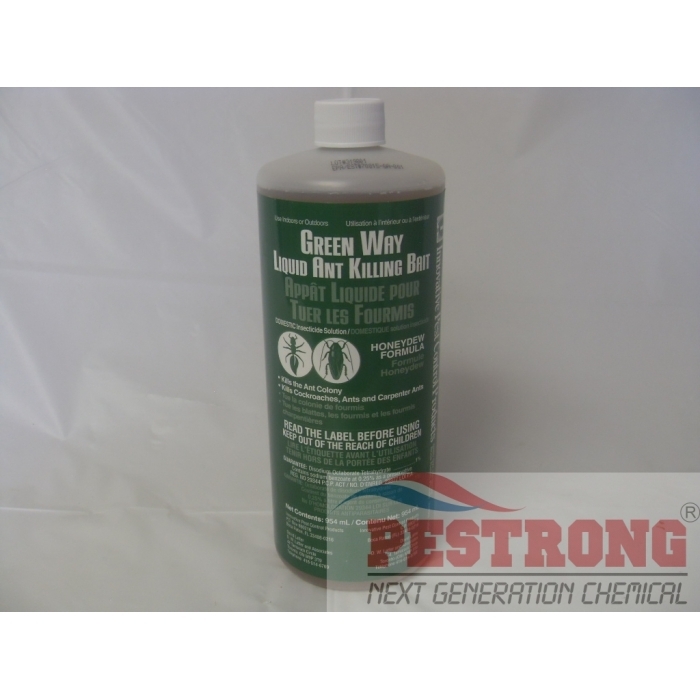 Green Way Liquid Ant Killing Bait Gourmet - 32 Oz - Gallon contains 1% DOT as the active ingredient. It is specially formulated to retard the development of mold and allow dilution to 0.5%. The ability to dilute with any food grade diluent helps optimize its cost effectiveness and significantly increases the potential for palatability to a wide variety of ant species. DOT (Disodium Octaborate Tetrahydrate) works slowly enough that the active ingredient can make its way all the way to the queen, so that you can get true colony elimination. Honeydew Formula is scientifically formulated to mimic the ant food produced in nature by aphids and scales. It can be used indoors or outdoors in cracks and crevices, or in any kind of Refillable Bait Stations to quickly eliminate foragers. Kills roaches and sweet & protein feeding ants, carpenter ants, argentine ants (not for fire ants and harvester ants). 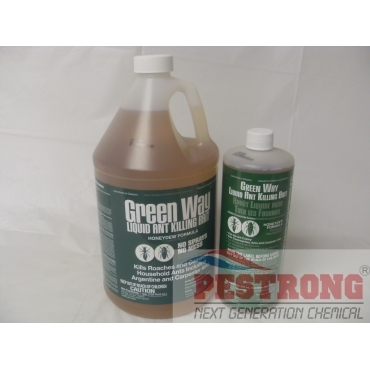 Gourmet Liquid ant bait has been changed Green Way Liquid Ant Killing Bait since april 2017. Just name changed. Product is totally same. Excellent liquid bait. Ants really love this stuff. That is until they are all killed. It works a slowly, but the slow acting nature of it allows for the the bait to affect the whole colony apparently. It works and kills off all traces of ants, so its claims seem to be correct. It completely eliminated all the ants in my kitchen! this stuff really works! I had a real problem with pavement ants this spring and this bait solved it! I used it in Antopia stations and once the ants discovered it, they flocked to it instead of my kitchen. I'm very pleased with the results! I'm very pleased with the results of this product for my Argentinian ant problem, used in the KM Ant Pro Stations.